The other day I caught myself ‘complimenting’ a work friend on her hair: “You have good shrinkage”. She had come to the office with freshly washed and air dried hair without manipulating it by twisting or stretching of any kind. It wasn’t matted or squashed and you could even see the little ringlets of curly strands making cameos. We laughed after I said it but I quickly called myself out on it. What exactly did I mean? As soon as I read that, I had a montage of flashbacks to when I’d rock up to work or a social gathering with my shrunken, unstyled fro and how people would look at me quizzically and ask (in silence or aloud) “What happened to your hair?”, “Did you cut it?”, “I thought you had soft hair”,”You look…different”. It’s these questions, comments and general reactions that validated my insecurities of wearing my hair unstretched. Hang on, doesn’t that defeat the whole accepting your hair as it grows naturally thing? I wanted to show off the full length of my hair. It’s taken me years to get to this length and it hasn’t been smooth sailing. So I wanted to show the fruits of my labour. Otherwise, what’s the point right? I love big hair and if my hair is big – whether manipulated to get there or not – I wanted everyone to see it. I felt cooler/funkier/more beautiful with my hair stretched. My thoughts were validated every time I rocked up to work or other social gatherings with my hair shrunken. Even on my Instragram account, my more popular styles are those that are fluffy and longer looking. Then when I finally got over it and began accepting that this was how my hair would always be, I began to appreciate shrinkage. I mean, how many people can style their hair in a way that made them look like they’re rocking a new cut? Then BOOM next day it’s long again. Natural hair is incredibly versatile. Maybe shrinkage isn’t supposed to be something we work against, but embrace, at least for the right reasons. Because I know wearing my hair shrunken these days just means tangles and breakage and that’s now the only reason why I stretch it. But the odd times I want to look like my hair has more volume or a kinkier look to match my outfit, I can. And easily. Isn’t that kinda… awesome? How do you deal with shrinkage? Is it an issue for you? Or do you just accept it as part of being natural? Protective Style 2: My First Twists! 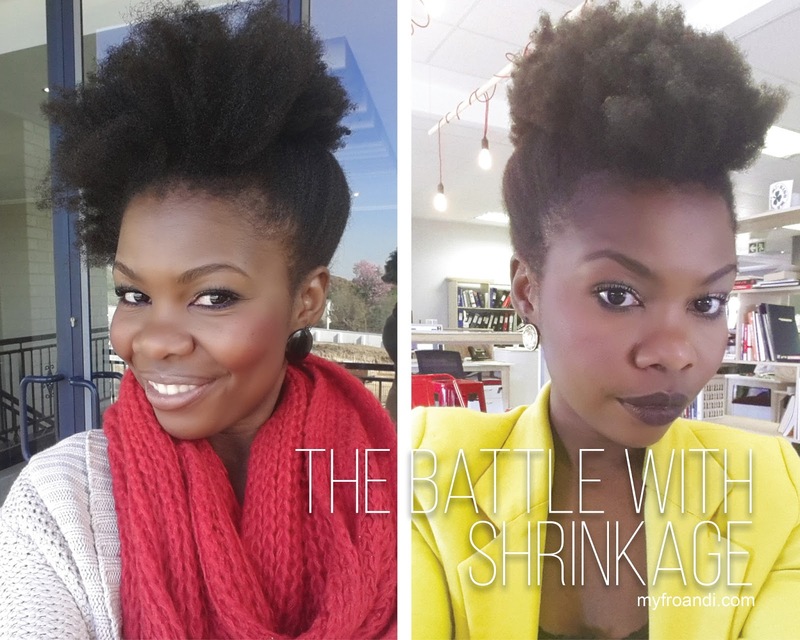 What is the best way to combat shrinkage when you spritz it and then it fizzles up? How do (did you rather) you maintain the length even when your has been spritzed ? Wore my 4c shrinkage out for two days, I felt like poo. I didn't strut as normally as I did, I felt worse than I do on my WORST hair days. I have tried embracing the shrunken look, I just can't. I feel poor looking. Sorry you felt that way, and this is why I've written about a couple topics that has touched on this. Can you elaborate on why you felt "poor looking"? I'm really interested in finding out why we have a negative view on our shrunken hair so that we can overcome it. Truthfully, a lot of times, I don't like shrinkage – like you, because it means a lot of tangles for me, and thinking about the work involved to detangle, it discourages me to even take good care of the hair. Because I don't stretch my hair that often, a lot of people (myself included) think my hair is short. When I do stretch it though, I get lots of compliments – even though it's the same hair I had in a shrunken state the day before. Isn't that funny though? Why does it get more compliments than when it's shrunken? Aesthetically, what's wrong with shrunken hair and why do we aspire and praise women with more stretched looking hair? I have learned to embrace my shrinkage since my 2010 BC. It's a part of my hair's personality. I have also learned the hard way that my hair needs to be stretched at some points during the week so I don't have tangles,but, my twists are definitely chunky. Thanks for weighing in. It also kills me to know that so many women regularly damage their hair in order to look "acceptable". I think as long as you're confident and affirm your decision to wear your hair a certain way, other people will see they can't express their negative opinions and are more likely to keep it to themselves.